Dear Tracy, Just read info regarding chemo-cooling. I am an LMT who is currently in nursing school. What therapists need to know also regarding chemo drugs are what they do when they reduce blood cell counts and when these counts are lowest (the nadir). If they reduce thrombocytes, the pt is at risk for very easy bruising and bleeding. Decreased WBCs will increase risks of infection. These low points during chemo can take place even 10 – 15 or more days after a pt’s infusions. 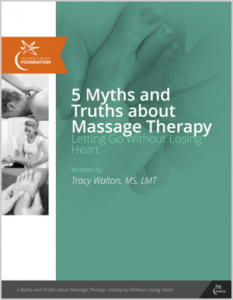 So much information for pt AND therapist to be aware of for safe treatments! P.S. – i will be coming to your June class. Denise, you are absolutely right. I mention low blood counts at the end of this post, but there is not space to go into the detail as you mention–there is in deed a lot to be aware of and incorporate. We will cover it in the course and we look forward to meeting you. Congrats on nursing school AND LMT. We need you. I have been a massage therapist and polarity practitioner for 35 years, working with many cancer patients for the past 16 years. It seems to me that cryotherapy is a defensive approach to controlling the side effects of chemotherapy and by its very nature rules out any massage benefits, massage being an active approach whose benefits are based on increasing and balancing the circulation of body fluids and energy in the whole system. It’s hard to prevent the effects of massage in one area of the body from reaching another part! It seems to me that massage therapy techniques, even gentle ones applied to other parts of the body, would increase circulation in feet, hands and scalp regardless of cooling attempts. I certainly understand the wish to save oneself from a period of chemo hair loss and especially to prevent neuropathy in hands and feet which can be long-term or even permanent. foot massages helped. Then again, maybe the elevation helped. So I think I’m in the “boost the circulation” camp, unless I consider the possible benefits of the elevation that slowed the circulation for hours at night (much more comfortable than ice!) This is a very interesting topic and I’ll be thinking about it a lot more now and looking for more research to study. Thank you! Thank you for sharing, Katherine. I appreciate interpreting the results of your own experience cautiously, and I think there is room for more research on cold therapy and massage and circulation. I’m not certain that massage in one part of the body produces systemic effects; even though it is a closed system, there is a lot of slack in it. So an increase somewhere can be limited in effects by autoregulation. We do know that metabolic demand, e.g. activity, is a true booster of circulation. I think we’ll know more about these other factors one day, hopefully soon. I am grateful for your thoughts and reflections. Thank you Tracy for again bringing relevant and substantive issues up for discussion! 2)	Could it be that gentle massage (with whatever limited impact on circulation that it has) actually reduces the risk of neuropathy? a. Circulation is movement, not stagnation. Does the massage also move the chemical away from the periphery, thus potentially reducing CIPN? 3)	Benefit/Risk ratio – I would be horrified to know that my MT contributed to someone’s risk for neuropathy but I am not convinced that this a likely conclusion, AND I think of the stacks of Pt evaluations I have universally reporting that the MT was of significant benefit. There are countless notes from grateful Pts expressing gratitude for the service that made the treatment more tolerable, less stressful, even a pleasant experience. Many Pts literally schedule their infusions based on our shifts. My conclusion, until more research or further input is offered, is that gentle, appropriately adjusted (see above) massage is still indicated, just as exercise is not contraindicated; and that the stress reduction benefits are of significant value to the overall wellbeing and treatment tolerance levels. I have shared these thoughts and suggestions/request for research with some of my UCSF Medical Center MD colleagues at the Osher Center for Integrative Medicine. I will keep you posted of their input as well. Or do we just latex gloves?! Any help would be GREATLY appreciated. I wish we could help, but it’s not in our scope. Please ask the nurse to guide you. Good luck! At our infusion clinic, we had a study with cold gloves and booties. One glove on one hand and one booty on the contra lateral foot. No benefit was found from using them. One patient confided to me that she actually felt the ice glove and boot sides were worse! Cold therapy is not new in infusion. Long time oncology nurses (practicing since the 70s) I work with share that they believe they notice increased brain mets with cold caps on breast cancer patients. One questioned whether restricting drug flow is wise because reduced potency might be missing those stray cancer cells. At the one day joint integrative oncology, fascia, and acupuncture conference a few years back in Boston, I saw a poster presentation which I understood to be hypothesising fascial restriction was contributing to CIPN, and he found with plantar stretching, CIPN reduction. I have observed a case of inadvertent fascial stretching eliminating an early , but persistent, case of CIPN. I’m not a big believer in the benefits of cold therapy for CIPN reduction, though I would be eager for my opinion to change . I’ve seen several mediocre cases of successful cold cap application, better results with thicker hair to begin with. If that is what people want, fantastic. Losing hair is hard for both men and women. And like you said, work around the caps. It’s not a big deal. The transitioning of caps is amazing to watch. It’s like a pit crew. Very cool. You might need to pause your treatment in that moment. More research needed. And I always like your warnings to us to not overproclaim or falsely claim any benefits of massage therapy. Likewise, I’m hesitant to overproclaim the benefits of some other seemingly trendy and inconclusive research. I’m my enthusiasm of sharing about CIPN and cryotherapy, I didn’t get to express how truly grateful I am for the work you are doing to advance the field of massage therapy. I am extremely grateful and promote the work you have done, especially about the things we were taught as canon which make no sense e.g. “massage removes toxins”. Thank you! I don’t think that came across is my post. I spend a lot of time alone observing and thinking about CIPN, lymphedema, cold cap, gloves, and booties. And chemotherapy. When I stumbled across your article, I was relieved to be able to share. some of these thoughts. I mean them in the most sincere way and am searching for truth. Thank you for providing the space! Diane, there was a glitch in my blog software and I am just getting your comments. My apologies, and thank you for taking time to share your thoughts! I appreciate the words from the front lines, and the more cautious thoughts about cold therapy. I understand being alone with your thoughts about all these topics. I’m so glad you found a mirror for them here, even for a moment. Bless you.